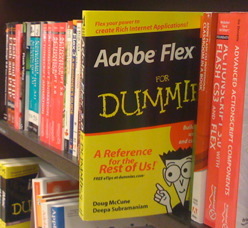 The compiled list of code samples from our Flex for Dummies book have been posted on the dedicated Flex for Dummies page of my blog. Each chapter (other than chapters 1, 4, 19, and 20) contains source code samples, and you can browse through them all online or download the code to run in Flex Builder yourself. We’ve double and triple checked everything to make sure it’s all error-free. You’ll see that each chapter contains two links, one to view the source code online and one to download a zip file. If you view the code online you can browse through each of the code listings for the chapter right in your web browser (and cut and paste to try running the sample yourself in Flex Builder). If you download the zip file you can get all the source files on your computer and load them right into Flex Builder yourself. Each chapter was created as a separate Flex project, so you can just create a new project for whichever chapter you like and copy over the files that are in the zip. We’re still pulling together the last of the samples, so the code for chapters 2, 8, and 12 is on its way. We hope to have those chapters posted by the end of the week. My sincere apologies for not having the code samples online immediately when the book shipped. Wrapping up the creation and production of a book like this was a whirlwind of activity, and we certainly slipped a little in getting the code online. As I am a newbie to flex. Please guide me as I am trying to make an application which would stream live video from sites like justin.tv, etc. Kindly guide me or give me sample code to make such kind of application. Hi i am new to flex.Please give me some help to do session with flex.I am nt using PHP in my application.I use LCDS. Please help……..